One of my family’s traditions has always been Buckeye Balls. We made them at holidays and it always ended in a huge, peanut buttery, chocolately mess. Now mind you, as a child I didn’t mind being covered in chocolate and eating the peanut butter balls that fell apart when I tried to dip them. But as an adult? Different story. Don’t get me wrong – I still love them. Love them. But the idea of double broilers and constant stirring to prevent the chocolate from burning… not appealing. Recently I had a terrible craving for peanut butter and chocolate, and it coincided with a coworker’s (now, former coworker – sniffle) last day at the company. He likes peanut butter and is moving to a country that does not make it easy to obtain said commodity. So I figured that would be a good excuse to concoct some sort of new PB+C, sugary solution. This is pretty much a Buckeye Ball, except in cookie form. There’s more chocolate than peanut butter to these, so I drizzled some peanut butter on the outside to make up the difference. One of the things that has always bugged me about Buckeye Balls is that as soon as I pick one up to eat it, my fingers are covered in melted chocolate. So unless I want to eat them with chopsticks, they’re always going to make a mess of me. God help me if I decided to wear white the day I try to eat them. But these cookies? No chocolate fingers. I considered calling them “Buckeye Ball Cookies” but then people might think they’re going to be chocolate-dipped cookies, and the chocolate fingers situation would still an issue. Just handheld, delicious, Reeses-reminiscent cookies. One of them satisfied my craving, but didn’t really make me feel that great about handing these over to my coworkers. I mean, I’m happy to share and all, but… okay, I’m not really happy to share. Not these. So if you see me hunkered over a plate of these on my couch, it would be in your best interest not to approach me. I might bite your hand. Just fair warning. A cookie-style spin on an old family favorite, Buckeye Balls. Instead of the tedious process of coating peanut butter balls in melted chocolate, you can just roll it all together! 1) Preheat oven to 375° F. Line two baking sheets with parchment paper or non-stick silicon mats and set aside. 2) In a medium bowl, whisk together flour, cocoa, baking soda, and salt and set aside. 3) In a large bowl, beat butter until fluffy and light. Add sugar, brown sugar, and 1/4 cup of peanut butter and beat well until mixture is fluffy. Add the egg and vanilla, beating to combine. Slowly add dry mixture to wet mixture and stir until well combined. Set aside and move onto prepping the peanut butter filling. 4) In a medium bowl, mix together 1/2 cup of peanut butter and powdered sugar until smooth. It may take a while, but hang in there – it will become smooth. 5) Grab a heaping tablespoon of dough and roll it into a ball. Flatten it with your hands and lay it down on the prepared baking sheets, keeping each disk of dough an inch apart. 6) Now grab about a teaspoon of the peanut butter filling mixture and roll it into a small ball. 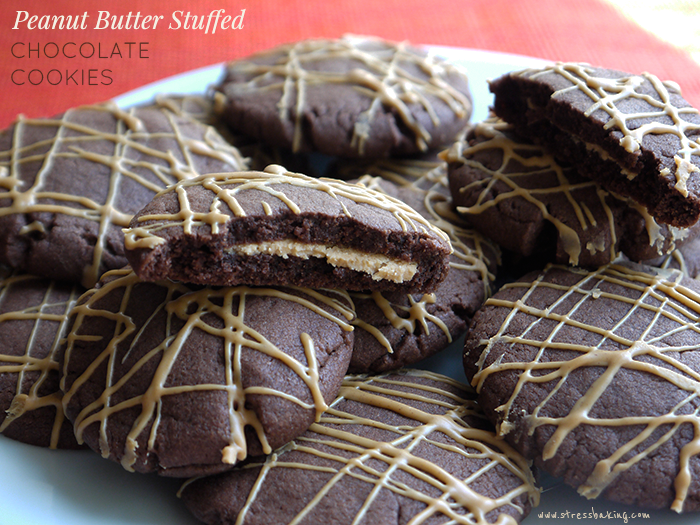 Place each peanut butter ball in the center of each cookie. 7) Now wrap the cookie around the peanut butter ball, making sure it’s sealed all the way around and roll back into a ball and place back on the baking sheet. Flatten each ball and make sure each of the cookies are 1-2 inches apart. 8) Bake for about 8 minutes, but make sure not to overcook! They will still be a little puffy, but they’ll settle once you let them rest on the baking sheets for a few minutes. Move to a wire rack to cool completely. 9) In a small bowl, combine remaining 1/4 cup peanut butter and coconut oil. Melt in microwave in 10 second increments, stirring until melted and combined. Place mixture in a plastic baggie with a teeny, tiny corner cut off and drizzle over your cooled cookies. Let them set and then enjoy! These look really good! Thanks for the sharing! Please guys, Fairfield has always overmatched Westport in every way. Fairfield has just as many celebrities and high ranking people in the economic/Wall Street world. Westport has never been a top place to live…sorry.